These plans are being replaced by our newer, more complete and higher capacity plans — 6’10” bed width, by 16′ length with a choice of 12,000# or 14,000# or 16,000# trailer capacity. In addition, we also revised our lighter 6×16 trailer plans replacing them with a similar 6’10” x 16′ trailer, but with 7000# and 10,000# options. Both new plan sets are customizable for a width matching these being replaced. The new plans also have length options of 14′ or 16′ deck. Please follow the links above to get the new plans, or get these now while they are still available. 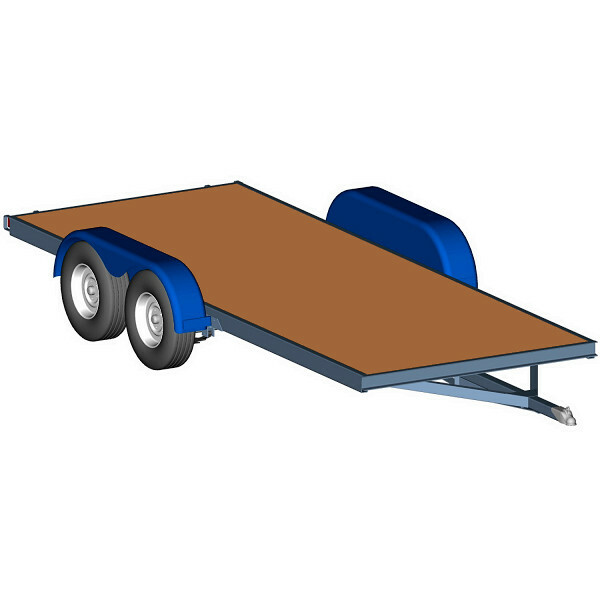 These plans for the big, strong, stiff trailer we provide won’t disappoint. This trailer is designed tough for continual heavy duty use. If you’re looking to build a large, very heavy duty trailer — one that has lots of options for customization — this is certainly one to consider. Tandem axle, leaf spring design. 12,000 lb. Combined Axle Capacity. Option for rear Tailgate/Ramp combination. Multiple options for trailer bed and for tie-down points. Removable / hidden ramp option. Plans include full drawings and illustrated instructions. * Trailers built from these plans have an actual bed width of 1.5″ wider than 6 ft., and bed length of 3.5″ longer than 16 ft. to accommodate the steel frame. Overall length including the tongue is 52 – 58 inches longer than the indicated bed length. Max load capacity (depending on options) is 12,000 lbs. (combined axle rating)* and includes the trailer weight. Trailer weight will vary depending on design options — Typically 1500+ lbs (tandem axle design) — which includes decking. With options, the weight may be much higher. Lots of options are included. Things like sides, a tail gate, a mounted toolbox, ramps, motorcycle stands, etc. are included for optional functionality. Some options are mutually exclusive. Not all options are shown in the pictures here. 10,000 lb. / 12,000 lb. * Load capacity is the complete trailer weight (Trailer + Cargo). Image shows a generic layout. Actual size will vary with parts chosen.